Reliable and energy efficient solid state Light Emitting Diodes (LEDs) have evolved to the point where they are now an attractive choice for many applications that were once the domain of incandescent lamps. These include indication, backlighting pushbuttons, panel overlays, liquid crystal displays (LCD’s), and most recently, general illumination. Since there are no moving parts, LEDs are very reliable under shock and vibration conditions. And unlike incandescent lamps, there is no surge current when energized. They don’t have a filament that will burn out, and they don’t get especially hot. They are also energy efficient and have a very long operating life. The current range they generally operate in is between 1 mA and 30 mA. One hundred thousand hours of operating life or more (sometimes much more) is not unusual for an LED. Wave Length: LEDs have a relatively limited light output in specific narrow bandwidth colors. This is good if you want a specific color, but, potentially problematic for wide spectrum light (white) for general illumination. Recently however, many applications have had successful results using ultra bright “white” LEDs for general illumination. They generally have a blue tint, which is often desirable in certain applications, but they are missing some wavelengths and won’t work in every application. However, Booted LEDs for blue-white lighting can compensate for this in some applications. Viewing Angle: LEDs are also narrow-angle emitters, and this can cause problems when they are being used as direct replacements for incandescent lamps. They don’t have the same illumination physics, and this should be considered when designing or retrofitting. LEDs emit light in a forward cone, often quite narrow, usually specified in view angle, such as 30°, 120° and so on. They achieve high intensity by reducing the angle through which they emit, and they have virtually no 90° off-axis light. Surface mount device (SMD) type LEDs tend to give the widest viewing angles of illumination, and forward angles of up to 150° exist for some highly diffused SMD LEDs. Luminous Intensity: The output of LEDs is usually expressed in millicandela (MCD). The candela is defined as the number of lumens per steradian of solid angle. It is typically measured along the projection axis and gives the perceived response to the emitted light at a defined current level. Forward Voltage: The brightness of an LED is a function of forward current, or the operating voltage at a specified current. The typical rating is the forward voltage at which the device will light. LEDs should not be subjected to forward voltage exceeding the maximum rating. Some applications require a resistor in series with the LED to assure that this voltage is not exceeded. Reverse Voltage: Since an LED is a diode, with anode and cathode connections, polarity is critical. If the voltage is applied in the reverse direction exceeding the Reverse Voltage rating (typically five volts), damage to the LED is possible. DC Forward Current: The defined current level at which the ratings of the LED are measured. Peak Forward Current: The maximum operating current under pulse conditions (1/10 duty cycle @ 1kHz). Operating Temperature: Optical and electrical ratings are at 25°C. Please note that LEDs exhibit a fairly straight-line change in intensity versus temperature. They are brighter when cold, dimmer when hot. The normal operating range for most LEDs is -20° to + 80°C. Storage temperature is -30° to + 100°C. Due to the lack of consistent international criteria for brightness measurement, a direct comparison of brightness data among different references is given. Because each of the LED Die could have different value of forward voltage VF and luminous intensity IV, two sorting operations are conducted in the manufacturing process. The first one is conducted before the LED dice are selected to be used for each production lot. In this process, LED Dice are chosen in a macro extent to ensure that the forward voltage and luminous intensity variations in such lots are minimal. Consequently, the brightness variation for each device is minimized to an extent which is not significant to the human-eyes’ visual effect. 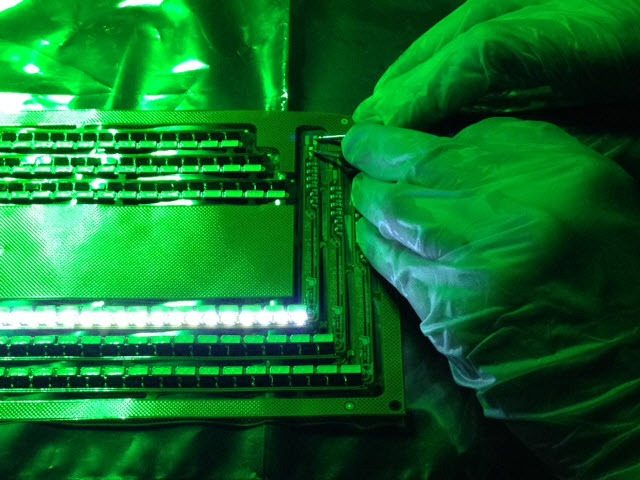 The second sorting is conducted after the LED Devices are fully assembled. during this process, the brightness of each device is measured and then sorted ina micro extent by BIN grade. Do not allow the LED device to be contacted by chemicals (such as Acetone, Trichloretylene, or Tetrachlor) which could harm the surface of resin. Whenever cleaning is necessary, please use Alcohol, Chlorosen, Difron solvents 3-E, Frigen 113TR, Arklone P, Kaltron 113 MDR, Fluqene 113, Chlrocene, or Freon TE with temperature of less than 45 degrees centigrade and with cleaning time less than 30 seconds. Lead forming must be conducted before soldering. Any physical stress applied to resin through leads due to P.C.B. warp, cutting, or bending leads might cause the disconnection of circuit inside resin. Please assure no excessive stress to the lamp all the time. For axial type of LED lamp, please make sure that leads are held firmly during forming, and should avoid forming leads on the base or resin as the turning-point of fulcrum. For manual soldering: Not more than 3 seconds @260, +50C, Under 30W. For wave soldering: Not more than 5 seconds @260, +50C. For reflow soldering: Not more than 5 seconds @245, +50C, after preheating from 70 to 800C, with in 30 seconds. The bottom base of resin should be at least 1.6mm above soldering surface. Avoid any stress applied to leads while they are heated. It should take at least 3 minutes for the LED lamp to return to normal temperature after soldering operation. Do not allow warping the mounted PCB after soldering. Soldering Bath: Not more than 5 seconds @260°C. The bottom ends of plastic reflector should be a least 3mm above the solder surface. Soldering Iron: Not more than 3 seconds @300° under 30 W.
The plastic reflectors (typically ABS) for LED devices are not heat resistant. Therefore, never apply physical stress onto the devices at high temperature. In order to prevent electric current shock, a current-limiting resistor should always be externally installed in series with each LED die, or dot, or segment. An improper current shock may cause burn-out, abnormal brightness decay, and/or burn-off of bonding wires, and LED dice. The resistor value usually runs from 80 to 220 ohms, but varies with each different LED and the amount of power (current) you want the LED to consume. The equation to calculate the corrrect resistor value is: (supply voltage – LED voltage)/LED current. For example, most microcontrollers can handle about 20mA of current per output. Using the brightest (10,000 MCD) white LED from Lumitron, it’s forward voltage is 3.4 (this number varies depending on the color of the LED). The microcontroller supplies 5 volts, so the equation would be: (5 – 3.4) / 0.02 (20milliamps) = 80ohms. Note that this is 80ohms, not 80Kohms. Also note that resistors do not always come in the exact values you need. This is okay; just get the closest one. Be aware that the lower the resistor value, the higher the current the LED will draw. LEDs have two leads, the anode (normally the longer lead) and cathode. To produce light, the supply voltage must be hooked up correctly, with the power (+) being connected to the anode, and the ground (-) being hooked up to the cathode.